This may be the first game of the Eurocup season for these two teams but it is far from the first time these two well-known names in European basketball will face off against each other. This is actually the fifth time these two teams have clashed and if you’re looking for a big game to enjoy the some top-notch basketball betting action, this could be the one. 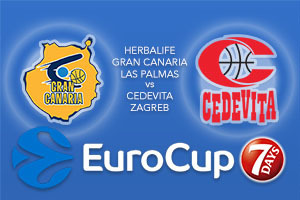 The hosts had the upper hand when these two teams clashed two seasons ago with Gran Canaria winning home and away. That was the season the Las Palmas side made it to the Finals. There are some big game players in the home team and you can expect Albert Oliver and Kyle Kuric to get involved with the action on Wednesday evening. There will also be Eulis Baez to deliver some points, which means the Gran Canaria side will think that they have every chance of doing the damage in this game. The hosts will be keen to get off to a fantastic start in the Eurocup this season and this game will offer them the chance. Zagreb have plenty of European experience to fall back on and you can bet that Luka Babic will be a big player in this game. Babic is the sort of basketball player that makes an impact on both ends of the court and you should expect to see plenty of him if you watch this game on Wednesday evening. David Stockton and Ra’shad James are also players to watch in the away side and if Scotty Hopson steps up to the plate, there is a good chance that the Zagreb side will have plenty of points on the board. The bookies believe the hosts are going to run away with this game and the home crowd will be hoping for this outcome. You can take Herbalife Gran Canaria Las Palmas at -12.5, which is available at odds of 1.90. If you’re interested in the Over/Under market, there is a great deal to be said for looking at going OVER 159.0, which is available at odds of 1.90. Bet Now!